“This image was taken on New Years day 2017. It’s taken from a short story I shot on the 50 or so people that every year brave the icy waters and freezing temperatures to partake in the New Years Day swim at Whitesands Bay, Pembrokeshire. I shot about 10 rolls of TriX that day, but unbeknown to me, my Hasselblad had a light leak and as a result a number of portraits where damaged. Thankfully this was one of the survivors. 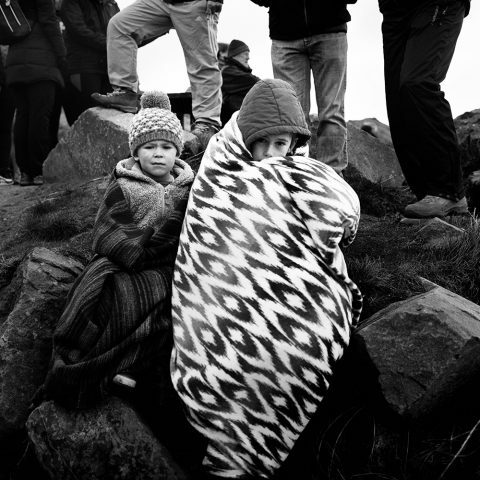 As soon as I got to the beach, I was immediately drawn to these 2 children huddled up under a mountain of blankets trying to keep warm whilst their dad partook in the swim and the whole world seemed to carry on around them. As I approached to take their portrait they didn’t move an inch, just sitting there staring straight at me with their eyes piercing down my lens. I took just one frame and then moved on.